Porsche was No. 1 in the influential survey for three years in a row. 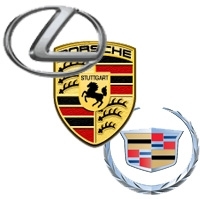 DETROIT -- Porsche slipped to second place behind Lexus in J.D. Power and Associates' annual ranking of initial quality in the United States, according to results released Monday. For three years straight the German automaker held the coveted No. 1 spot in the market research firm's influential study. Despite reducing its number of problems per 100 vehicles to 101 from 104 last year, Mercedes-Benz fell from fourth to a tie for sixth with Toyota. Ford and Chevrolet ranked virtually even with Mercedes and Toyota in the benchmark survey. Ford improved to 102 problems per 100 vehicles and Chevrolet to 103. That put all four brands in the same league in the United States when it comes to customer complaints during the first 90 days of ownership. There is no statistical difference between a 101 and a 102 or, for that matter, between a 101 and a 103, said David Sargent, J.D. Power's vice president of automotive research, in a presentation to the Automotive Press Association. Overall industry quality improved to its best level in the studys 23 years. That average was 108 reported problems per 100 vehicles, down from 118 in 2008. Mercedes' German rivals BMW and Audi were both below the industry average. Owners of U.S. brands recorded an average of 112 problems per 100 vehicles. A year earlier, the U.S. automakers had 124 reported problems, or six more than the average. The study ranked 37 brands based on problems detected in the first 90 days of ownership of 2009 model-year vehicles. Toyota Motor took in 10 awards for having the highest-quality vehicles (Toyota, Lexus, and U.S.-only entry-brand Scion) in individual segments. Ford Motor had four, while Honda Motor Co., Nissan Motor Co. and GM had two each. Toyotas Lexus brand had 84 problems per 100 vehicles in reclaiming its title. Porsche had 90 and Cadillac, 91. Hyundai -- which through May had seen U.S. light-vehicle sales decline 7.9 percent, compared with the industry's 36.5 percent drop -- improved from 13th last year to fourth this year. It was the best showing for the Korean brand since its third-place finish in 2006. Honda completed this year's top five. The Ford brand ranked eighth in the study for the second straight year and above the industry average for the third straight. For the 2009 study, J.D. Power asked more than 80,900 purchasers and lessees 228 questions about their first three months of ownership. Power conducted the study from February through May.